Art As Conversation NPR's Melissa Block and music critic Tom Moon discuss the thrill of intimacy on three new albums by duos. 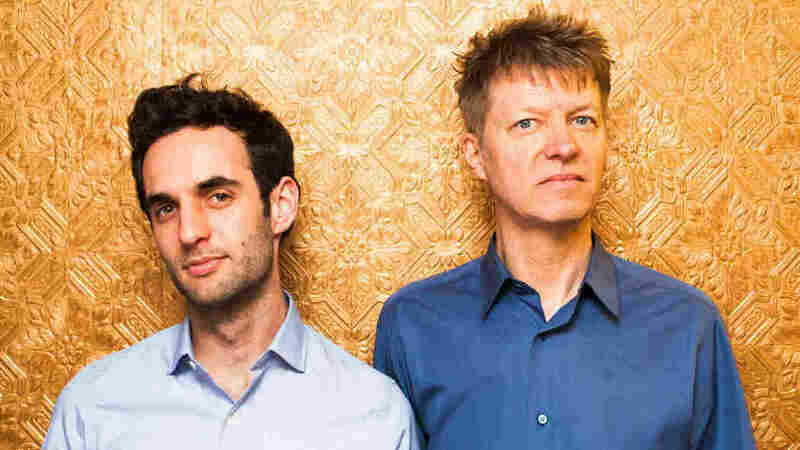 Nels Cline and Julian Lage's new collaborative album is called Room. Jazz bassist Dave Holland and pianist Kenny Barron's new album, The Art Of Conversation, is one of a few new duo records that have recently caught the attention of music critic Tom Moon. Its title serves as an entry point into what Moon says is crucial when artists record collaboratively. "The duo setting is all about conversation and only conversation," Moon says. "It completely relies on what the two participants bring." NPR's Melissa Block spoke with Moon about The Art Of Conversation and two other double-bill releases: banjo superstars (and married couple) Béla Fleck and Abigail Washburn's eponymous album and the unlikely collaboration between Wilco guitarist — and avant-garde mainstay — Nels Cline and jazz traditionalist Julian Lage, titled Room. Hear their conversation at the audio link, and browse the music — with Moon's commentary — below. Kenny Barron is just one of the most fluid and sly and kind of subtle pianists. Dave Holland, equally veteran bass player, plays the same way, and you can hear them listening to each other. They have to cover the rhythm, the harmony, the melody, and they switch roles really easily. But more than that, they're thinking about the interaction and the language that they'll use to go back and forth with each other. We're used to hearing jazz players play in quartet or quintet; this really brings you down to the essence of the music. Fleck and Washburn recorded this album at home in their basement studio after the birth of their son, Juno. And the playing is just rich. They don't play the same style — Fleck plays in the three-finger style, Washburn in the more traditional clawhammer style — but they sort of mesh beautifully. On "What'cha Gonna Do," we even hear a rare example of Fleck's singing. It sort of adds to this feeling of, you know, they're just in a room playing and here's what we got. [This album] reminds me a little bit of the old Chet Atkins and Les Paul duets; it has some frantic energy in it. But I like the way they set up like a phrase or an idea ... and then they'll go exploring off of that, sometimes in free improvisation, which Lage has not done at all. His recorded career has been very much driven by the standards and, sort of, the classic jazz songbook. You can feel that he's stretching maybe a little bit to fit into Nels' world. And Nels is probably moving a little bit toward him. It's definitely brokering a middle place between where each of them are comfortable. And here they're playing off each other and going in places I didn't expect. I like how you really hear the attacks, too. You're getting that sense of them being right next to each other, bouncing ideas.